I don’t know why I missed out on including Zero Time Dilemma when I wrote about the Nintendo 3DS games to look forward to for this year. I guess it fell out of my radar. Well, Zero Time Dilemma is going to be released worldwide this June so now is a good time to talk about it. Zero Time Dilemma is the third game in the Zero Escape trilogy. The first two games in the said trilogy (Nine Hours, Nine Persons, Nine Doors and Virtue’s Last Reward) are both visual novels with puzzle solving elements. I liked both games a lot, especially Virtue’s Last Reward which improved on a lot of the flaws of the first game (let’s just call it 999). Zero Time Dilemma retains the same puzzle solving aspects of the first two Zero Escape games, but I don’t think I can call it a visual novel anymore. But before I talk about Zero Time Dilemma, let me talk about the previous games first. As I mentioned, these two games are visual novels so both games had a lot of sequences that required players to do a lot of reading, especially 999 which had no voice acting. This can turn some people off of the game – in fact, this is one big reason why I have trouble recommending Virtue’s Last Reward to my friends, despite me loving that game a lot. Both games also employed multiple endings, a standard of visual novels, which resulted in going through some backreading in 999. This issue was alleviated in Virtue’s Last Reward as the game allowed you to skip to the choices that resulted in the branching storylines. 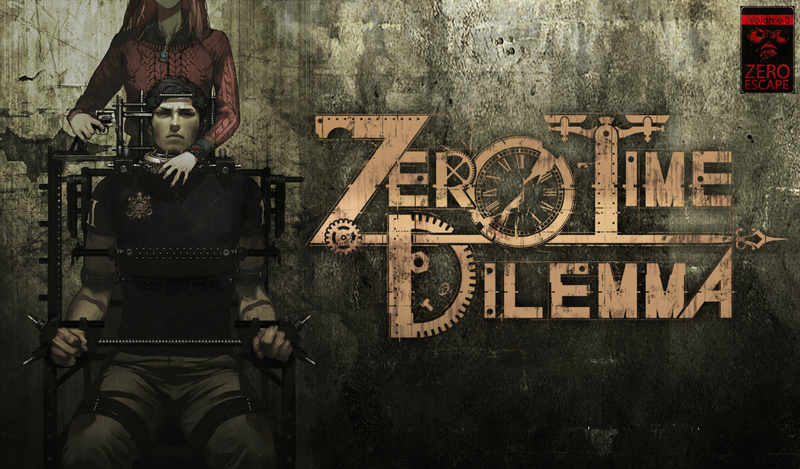 Zero Time Dilemma, as it turns out, will be quite different from the first two games in the trilogy. According to Aksys Games, who will publish the game in western territories, the visual novel segments will be replaced my cinematic sequences. “You can play the game without reading,” according to the developers. 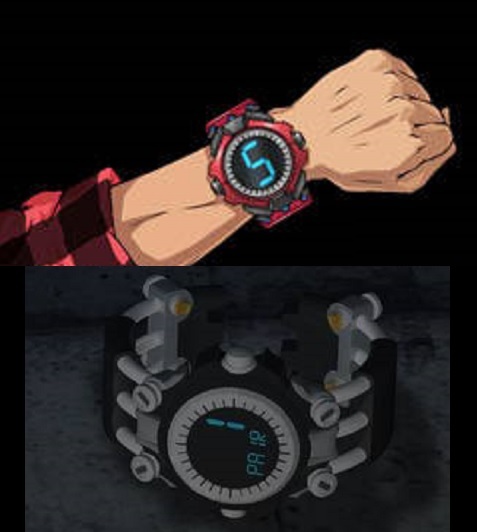 Specialized bracelets are a trademark of the Zero Escape games and will return in Zero Time Dilemma. The interesting stuff doesn’t end there. Both the previous Zero Escape games involved nine people who are forced to play some sort of “game” – the Nonary Game in 999 and the Nonary Game Ambidex Edition. Of the nine people, the player experiences the events of the game through the eyes of the main protagonist (Junpei in 999 and Sigma in Virtue’s Last Reward). Because of the mechanics of the Nonary Game, the group of nine are forced into breaking up into smaller groups, so the player/Junpei/Sigma isn’t involved in everything that happens. Anything that happens that Junpei/Sigma don’t directly witness is told to the player by the other characters through exposition. 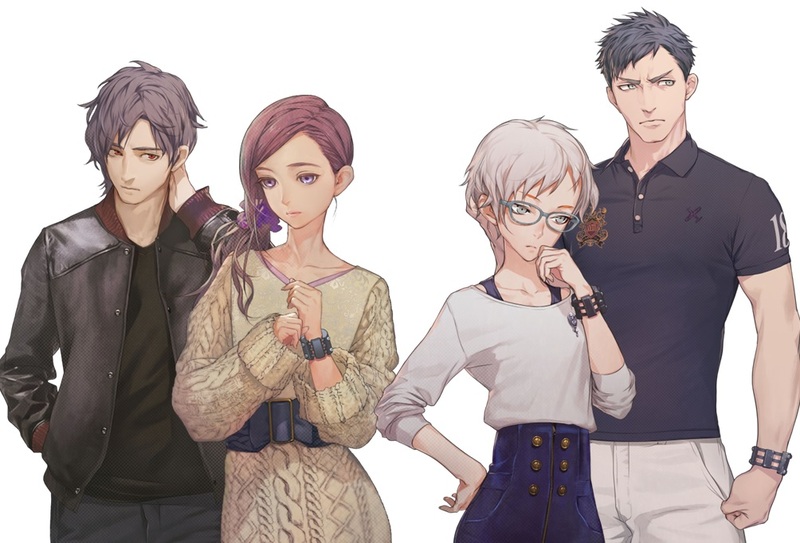 Zero Time Dilemma is similar in that there’s a group of nine people forced to play a game (called the Decision game this time around), but instead of breaking up the group of nine into smaller groups, they start off in three different teams from the get go. The player then goes through the events that each of the teams go through, and these are separated in “chapters” that represent separate 90-minute periods. These chapters consist of an initial narrative section, the actual puzzle solving (presented in an escape-the-room manner), and is book-ended by a moral decision. After each “chapter”, the characters in the story are injected by a special serum (through a specialized bracelet) via that makes them lose their short term memory, so the characters and the player won’t be able to tell when exactly each chapter is taking place in the storyline. 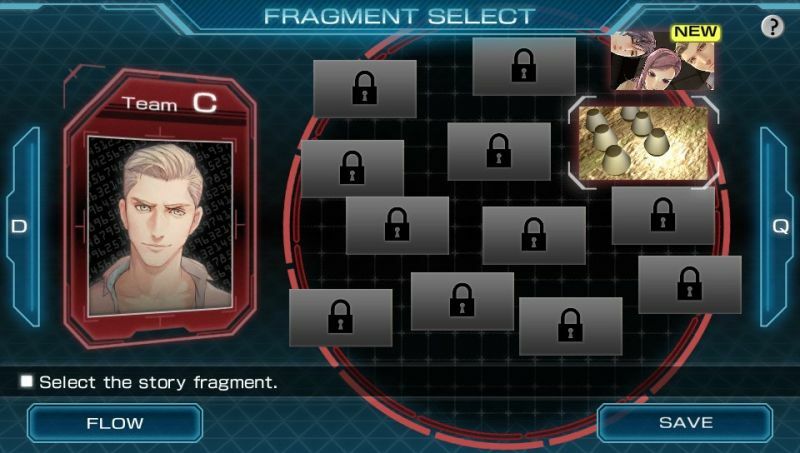 The story of Zero Time Dilemma will be told in non-linear fragments – you’ll only know when a specific fragment takes place in the flow of the story after you’ve played it. The main protagonists of both games, Junpei and Sigma, will return in Zero Time Dilemma, and they even have their co-protagonists (Akane in 999 and Phi in Virtue’s Last Reward) along with them. Because of the fragment structure of storytelling and the player being allowed to experience what each of the three teams went through, it’s hard to tell who the main protagonist is going to be. Or maybe both Junpei and Sigma, along with a third character, will all be the “heroes” of Zero Time Dilemma? Whatever the case may be, it’s definitely nice to see the four protagonists of the previous Zero Escape games in one adventure. From left to right: 999’s Junpei and Akane are joined by VLR’s Phi and Sigma in this adventure. Finally, some scenarios (choices? Are these the moral decisions?) were programmed to have randomized outcomes, according to the developers. In one demo, one sequence involved firing a revolver with three bullets. The first outcome resulted in a blank being fired, but a second attempt resulted in a live bullet getting fired – even if the same choices were made. I’m not exactly sure how I feel about this. It may become more difficult to get all of the multiple endings if the outcomes are random, but the idea of randomized outcomes is definitely intriguing. I loved both Nine Hours, Nine Persons, Nine Doors and Virtue’s Last Reward and because the latter ended with a cliffhanger, I’ve been looking forward to the final game in the Zero Escape trilogy even before learning about all these. Now that I know about all these changes, I’m even more curious about the game. Zero Time Dilemma is definitely a game worth considering, and I think all Vita/3DS owners should be aware of this game. Zero Time Dilemma is set to be released on the Nintendo 3DS and Playstation Vita on June 28, 2016, and on PC on June 30, 2016.